Newark’s brightest and best will be out in force on Saturday 11 April, ready to put on a first class show when Superstar Fight League 2 and Rookies Rumble V come to the Magnus Sports Centre. In an action-packed evening, both amateurs and professionals from NMA Fitness Centre and Suggy’s Gym will line up to showcase their skills in the ring. 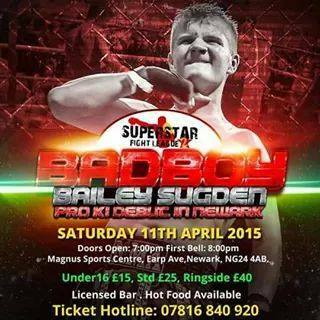 Appearing for the first time as a professional before his home crowd, Bailey ‘BadBoy’ Sugden tops the bill in the main event of the night. Just three weeks after a double victory in his pro debut at the Harrow Leisure Centre, 17 year-old Bailey will be up against Vinny Baldwin, an opponent so far unbeaten under K-1 rules. Also on the card are home favourites Sam Hardy, Andrew Price, Jordan Haywood, Megan Williams, Alex Bratton and Krzysiek Adamczyk. Completing the line-up and making their Newark debut for NMA are Emma Porter, Tom Waite, Tom Rawlinson and Kristian Kraatz. Doors open at 7pm with the first bell at 8pm and a licensed bar and hot food will be available throughout the evening. Limited VIP places at £40 and advance tickets for unreserved standard seating, priced £25 for adults and £15 for under 16s, are on sale now from NMA Fitness Centre, 49 Castlegate in Newark or via the ticket line on 07816 840920.